Mad Max: Fury Road has already begun its hellbent descent on digital download platforms, and will arrive at the Valhalla of home video next week. But there’s no denying that out of all the films this summer, none have inspired as big or creative a fanbase as Mad Max: Fury Road. Search this site for the tag “Mad Max: Fury Road” and soon be greeted by mashups, artistic reinterpretations, songs, backstories, deleted scenes, and a whole host of other ephemera that people created after seeing the film. Something about the film connected deeply with the artistic side of the viewing public, and out of that connection has sprung forth many interesting permutations. 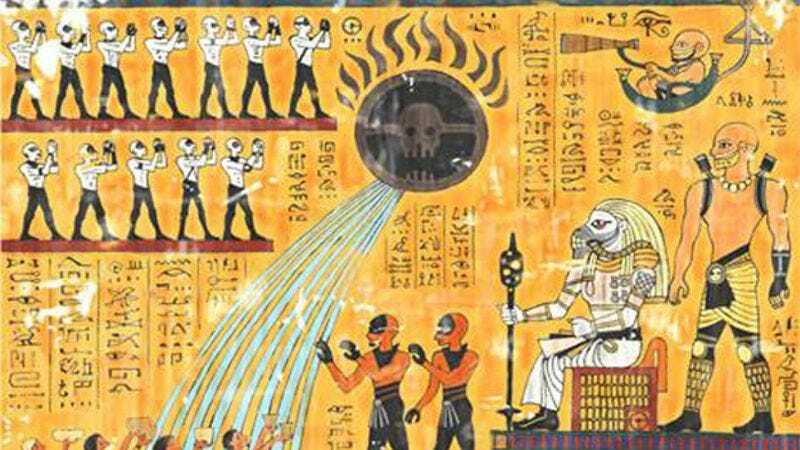 The latest is from an artist named Takumi who has rendered the entire epic guzzoline journey for empowerment and independence into an Egyptian hieroglyph. It’s an impressive piece of art with an attention to detail that retells the story perfectly. It aptly captures the film’s post-apocalyptic feel, as well as the ancient style for which it so gloriously strives.